... and have them fitted at one of our centres of excellence. 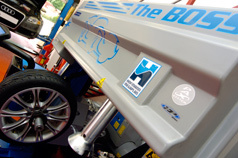 Blackboots and Wheels in Motion is a completely unique, first class facility, for the supply and installation of tyres, wheel alignment, steering geometry, brakes, exhausts, wheels, wheel refurbishment and suspension. You can now buy tyres online from us and have them fitted at one of our network of UK partner tyre fitting centres. Equipment is one thing, and we do have the best, but technical expertise and our experience is what makes us the industry leaders in wheel alignment, steering geometry and chassis dynamics. No expense has been spared in the kitting out of the state of the art depot where The Boss Touchless Tyre Machine, the Hunter Hawkeye 811 Pro Wheel Aligner and the Uniflate Nitrogen Tyre Inflation System, rub shoulders with other equally impressive pieces of plant and equipment. Blackboots and Wheels in Motion : A truly bespoke service from Ferrari to Fiesta. 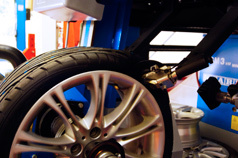 New tyre fitting and wheel alignment for all makes and models. Wheels in Motion is widely recognised as the daddy of MX-5 chassis alignment in this region and most probably the UK. 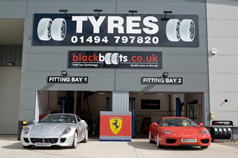 Blackboots and Wheels in Motion offer a bespoke tyre fitting service for all models of car and supply a full range of tyre brands. 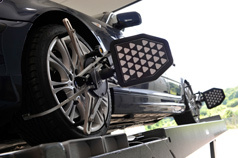 Blackboots and Wheels in Motion offer a bespoke wheel alignment service for all models of cars. Steering geometry setup by one of the country's leading race car technicians. 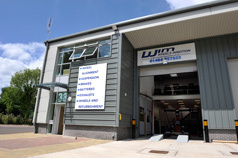 View our state of the art tyre fitting and wheel alignment workshop facilities, located in Chesham, Buckinghamshire. State of the art technology from Blackboots and Wheels in Motion. See our amazing touchless tyre machine in action in this video. Ferrari Day, Club Meets and customers' vehicles we have had visit our workshops.